was held on April 21, 2017 at the Rustic Lodge in Indiana PA. Presented by the League of Women Voters of Pennsylvania. 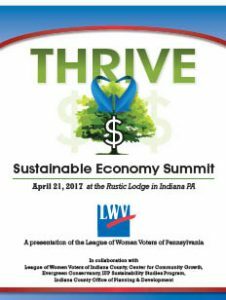 In collaboration with League of Women Voters of Indiana County, Center for Community Growth, Evergreen Conservancy, IUP Sustainability Studies Program, Indiana County Office of Planning & Development. The Hon. Sherene Hess After a career in conservation and public policy work, Sherene Hess is now serving her first term as Indiana County Commissioner. of the Clean Jobs Pennsylvania report. Sharon also manages the Solarize Allegheny project for SmartPower, a national non-profit marketing firm for clean energy which encourages homeowners and businesses to go solar, and she is a facilitator for the PA Department of Environmental Protection’s Finding Our Solar Future project. She serves as the elected president of the Solar Unified Network of Western Pennsylvania (SUNWPA), the region’s solar trade organization, and as a steering committee member for the first solar cooperative in western Pennsylvania. During her eight years at PennFuture, Sharon was the Project Manager for solar programs and provided community outreach for climate change and clean energy policy. She holds an M.A. in Earth Literacy from St. Mary’s-of-the-Woods College in Terre Haute, IN and a B.A. in Psychology from Mansfield State University. Dan Boone (Windmills) is Professor Emeritus at Indiana University of Pennsylvania in the Philosophy Department. Since his retirement he has obtained 5 patents on a new concept of vertical axis wind turbine and associated refinements. He is working on another patent on a generalized energy storage process. His company, Ekodyne, Inc., is presently engaged in R & D on the wind turbine design and hopes to have a prototype evaluated this summer at the Penn State Wind Turbine Field Test Facility. John Stolz Ph. D. (Biodigesters) has been at Duquesne University since 1990, and is Director of the Center for Environmental Research and Education. He is a professor of environmental microbiology. His teaching includes a course on environmental science for business professionals. Dr. Stolz has a BS from Fordham University and a PhD from Boston University. He was an NRC Post doctoral fellow at the NASA Jet Propulsion Laboratory and the Department of Geology and Planetary Sciences, California Institute of Technology, and had an NSF Postdoctoral Fellowship in Plant Biology in the Biochemistry Department at the University of Massachusetts, Amherst. An environmental microbiologist, he has researched microbes that metabolize arsenic, selenium, and chromium, and more recently the feasibility of biodigesters for natural gas production. Dr. Stolz has published 81 journal articles, 34 book chapters, and authoredited two books. Allison Rohrs (PA Wind Maps) is the Director of the Saint Francis University Institute for Energy. Allison holds a Master’s degree in Energy and Mineral Engineering from Penn State and a Bachelor’s degree from the University of Colorado in Environmental Science. She is a BPI certified home Building Analyst and Envelope Professional. Allison spent years working for the U.S. Fish and Wildlife Service as well as working in Grand Teton National Park. In 2011, she moved to Pennsylvania to work as a wind turbine technician and has worked on Pennsylvania renewable energy issues ever since. the Green Jobs and the CCAC Solar Program advisory boards as well as writing a successful grant for Conservation Consultants Inc. with the Community Foundation of the Alleghenies to operate certification classes for solar installers. He was also a founding member of SUNWPA the Solar Unified Network of Western PA. This organization, originally founded by solar professionals and other affiliates has expanded to include solar power system owners and other enthusiasts interested in growing the local industry. 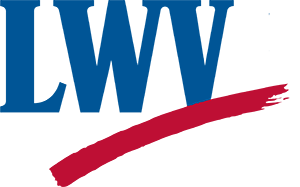 It has undertaken lobbying at the state level to improve the financial viability of solar investment as well as working with local municipalities at developing a consistent ordinance and permitting process for solar through DOE’s SunShot Initiative. Terrence Collins Ph.D., Hon FRSNZ is the Teresa Heinz Professor of Green Chemistry and Director of the Institute for Green Science at Carnegie Mellon University. At CMU in 1992, Terry taught the first course in the world in green or sustainable chemistry. He is renowned for inventing the first small-molecule mimics of oxidizing enzymes, thus solving a multibillion dollar research challenge that has occupied a large branch of chemistry for over five decades. Oxidation chemistry is a huge component of industrial chemistry. The Collins catalysts, called “TAMLs” and “NewTAMLs” can enable important industrial processes to be carried out Nature’s way, thereby providing potent tools for avoiding toxic byproduct. Among his many honors and awards is the Presidential Green Chemistry Challenge Award (EPA-1999). Joseph Pizarchik, as principal of Pizarchik Advancements, is working as an independent advisor/consultant/lawyer in the fields of mining reclamation, reforestation, and water protection and improvements. Previously he served as director of the Department of Interior’s Office of Surface Mining Reclamation and Enforcement (OSMRE) in the Obama administration (2009–2017) and before that as director of Pennsylvania’s Bureau of Mining and Reclamation, part of the state’s Department of Environmental Protection. Pizarchik was one of the authors of Pennsylvania’s Environmental Good Samaritan Act and provided counsel during the development and implementation of the Good Samaritan program. In addition to working on various mining-related statutory and regulatory amendments, Pizarchik played important roles in the development of Pennsylvania’s program for volunteers to clean up abandoned coal refuse sites, the state’s program for mine operators to establish trust funds obligations, and measures to secure explosive storage facilities. He also eliminated impediments to the construction of the Flight 93 National Memorial. He is a graduate of the Pennsylvania State University and the University of Arkansas at Little Rock School of Law. Jessica Shirley is Policy Director of the Pennsylvania Department of Environmental Protection. responsible for engaging the public in meaningful dialogue and coordinating the Department’s initiatives through its many advisory committees. The Policy Office also manages the agency’s regulatory development, review and approval process, and is responsible for principal administration of the Environmental Quality Board and Board of Coal Mine Safety. Jessica also oversees the Office of Pollution Prevention and Energy Assistance (OPPEA), which performs and administers the functions of the Pennsylvania Energy Office. OPPEA works with citizen’s groups, businesses, trade organizations, local governments and communities to help them reduce pollution and save energy. The office works to foster and develop alternative energy solutions. Ms. Shirley joined the DEP Policy Office in 2011 after spending a year in the Department of Labor & Industry’s Office of Policy, Planning and Development. Jessica received her Master’s Degree in Public Administration from Penn State University and her Bachelor’s Degree in Economics and Political Science from Indiana University of Pennsylvania. Jamie Douthit is an AmeriCorps OSM/VISTA volunteer with the Evergreen Conservancy and the Crooked Creek Watershed Association. Her goals for the year include increasing outreach efforts for both organizations, building the capacity of water monitoring efforts in the South Branch of Plum Creek, and creating an EcoTour for Indiana County. She has been working closely with local partners and community members to identify and highlight environmentally significant areas and projects in the county. Maria Jack handles Group Sales and is the Public Relations Specialist for the Indiana County Tourist Bureau, the designated tourism promotional agency for the county. For four years she has provided step-on guide service to most all incoming tours to the county, assisting in itinerary building for schools, seniors and leisure travel. Representing ICTB at numerous national and local travel and public relation shows, she keeps a pulse on marketing Indiana County to a variety of demographics, with ecotourism being a vital subject of interest to visitors. Hannah Smith-Brubaker is the Executive Director of the Pennsylvania Association of Sustainable Agriculture (PASA). She is the former Deputy Secretary of the Pennsylvania Department of Agriculture. As Deputy, she focused on agricultural markets and economic development, farmland preservation, and the charitable food system. Hannah operates Village Acres Farm & FoodShed – an organic produce and pastured poultry farm in Juniata County. Village Acres has been in operation for 35 years, 25 of which have been organically certified and nearly 20 of which have involved year-round community supported agriculture. Hannah brings more than twenty years of off-farm experience in nonprofit education, community development, business administration, and a proven record of working with the full diversity of agriculture, insisting on inclusion and open dialogue. statewide environmental organization. Jim holds a BA from Cleveland State University in Political Science and History and a Master’s of International Development focused on Development Planning and Environmental Sustainability from University of Pittsburgh. hydraulic fracturing. Poole also mentors students in applied participatory research through the Appalachian Teaching Project and serves as co-chair of a new Sustainability Studies Program at IUP. Susan Comfort, Ph.D., is an associate professor of English at Indiana University of Pennsylvania, where she teaches Postcolonial and Third-World Studies (especially Anglophone South Asian and Caribbean Literature), and Feminist Environmental Justice Studies. In recent years, she received a Fulbright Fellowship to study in India, where she researched feminist agents of environmental change in Indian culture and literature. In her inquiry into how varieties of feminist agency have emerged in response to an ecological and social crisis in India, Dr. Comfort interacted with numerous scholars and representatives from Indian universities and non-profit organizations through the Centre for Women’s Development Studies in New Delhi. She currently co-directs the new IUP Program on Sustainability Studies, and serves on the board of the IUP Center for Northern Appalachian Studies. Michael Sell is Project Coordinator of St. Francis University Institute for Energy. Michael has been involved with a variety of projects at the Institute since 2008, ranging from organizing seminars and conducting renewable energy assessments, to maintaining the Institute’s website and educating everyone from toddlers to adults about energy. He holds several renewable energy certificates and is a BPI certified Building Analyst and Envelope Professional. He obtained a Bachelor’s degree from SFU in 2010 and is in his final semester of the university’s M.B.A. program. © 2018 The Straight Scoop on Shale. All rights reserved.